Sitting independent MP Clover Moore also serves as Lord Mayor of Sydney. The state Coalition government recently passed legislation prohibiting sitting MPs from running for Mayor or Council. Clover Moore has stated that she will resign from Parliament prior to the September council elections in order to run for a third term as Lord Mayor. Read the profile for the seat of Sydney at the 2011 state election. Clover Moore, since 2007. Previously Member for Bligh 1988-2007. Central Sydney. The seat of Sydney mainly covers parts of the City of Sydney, as well as parts of the neighbouring Woollahra and Randwick local government areas. It covers the Sydney CBD and the suburbs of Pyrmont, Ultimo, Surry Hills, Darlinghurst, Potts Point, Woolloomooloo, Paddington and Woollahra. Clover Moore previously dominated the seat of Sydney as an independent. Without her presence, there are two key questions: how much of her independent vote goes to her anointed successor Alex Greenwich, and how the rest of her vote breaks down party lines. 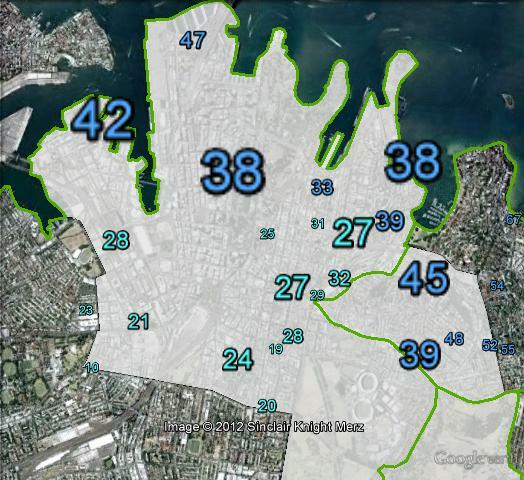 You can analyse what Sydney looks like without a strong independent by looking at the vote in the NSW upper house at the 2011 state election. 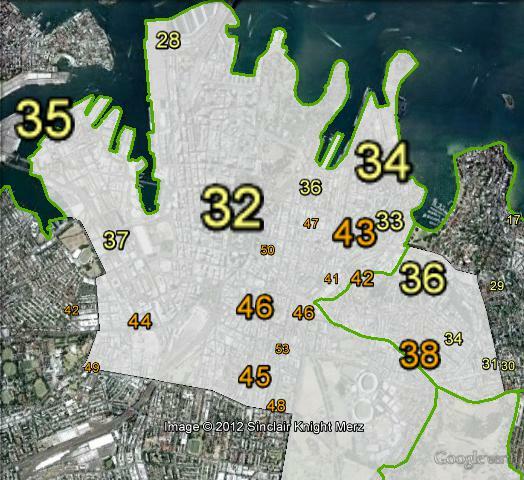 The Legislative Council vote in Sydney was dominated by the Greens and the Liberal Party, while the ALP was far behind. Alex Greenwich is a strong candidate. Clover Moore is actively supporting him with endorsements and he is running a well-resourced and prominent campaign. His marriage equality activism is well suited to a seat with a large gay population. One poll in the electorate had Liberal candidate Shayne Mallard and Alex Greenwich tied on 31% with Chris Harris not far behind on 25%. If the vote is split roughly evenly between the three serious candidates, the seat will likely go to Greenwich or the Greens. If the Liberals were to come in the top two in that scenario the other candidate in the top two would likely win with a solid preference flow. If the Liberals are to win they will likely need to have a substantial lead on primary votes, however some preferences will exhaust so it won’t be necessary for the Liberal candidate to win a majority of the primary vote. Booths in Sydney have been divided into four areas. Most booths lie in the east of the seat, around one of three suburbs: Surry Hills, Darlinghurst or Paddington. Booths have been divided into these three areas. The remainder of the seat, including the CBD, Pyrmont and Ultimo, has been grouped as “Sydney”. Clover Moore won three of the areas, with the Liberal Party winning Paddington. In the Legislative Council, the Liberal Party won three of the areas, with the Greens winning Surry Hills. Breaking the seat down geographically, the Liberal Party won the six booths in Woollahra Council as well as five booths in the City of Sydney, while Clover Moore won sixteen booths, all in the City. Moore’s vote peaks in Surry Hills and Darlinghurst. When you look at the Legislative Council vote, the Liberal Party won all the same booths, as well as five that were won by Moore in the Legislative Assembly. The Greens won the remaining eleven booths, all of which were won by Moore in the lower house. Polling booths in Sydney at the 2011 state election. Sydney in red, Darlinghurst in green, Surry Hills in blue, Paddington in yellow. 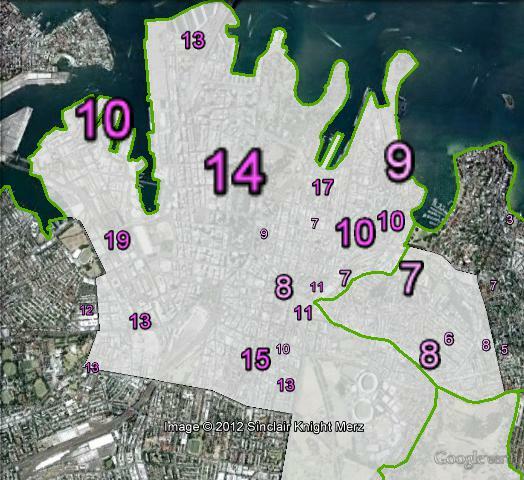 Primary votes for independent Clover Moore in Sydney at the 2011 state election. Liberal primary votes in Sydney at the 2011 state election. 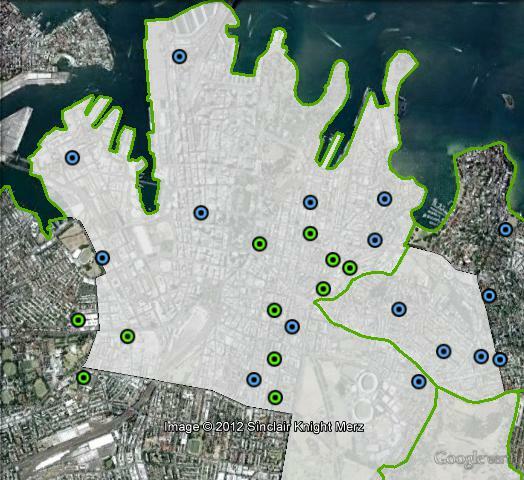 Greens primary votes in Sydney at the 2011 state election. Labor primary votes in Sydney at the 2011 state election. Polling booths in Sydney at the 2011 state election. Booths are coloured according to the party that won the vote in each booth in the Legislative Assembly: Clover Moore in yellow, Liberal in blue. Polling booths in Sydney at the 2011 state election. Booths are coloured according to the party that won the vote in each booth in the Legislative Council: Greens in green, Liberal in blue. I’m no supporter of Clover Moore, but the way she has been thrown out makes my blood boil. I just hope the electorate sees this for what it is and thumps the Liberals for it. Was there a Vaucluse b/e in 1988? The last ALP MP for King was known for his links to organised crime. I would fully expect Labor to contest this. They contested Clarence to protect the Federal member up there. Tanya Plibersek would get the same treatment. It’s worth noting that, like Clarence, Labor did a bare-bones campaign here in 2011, knowing they couldn’t win, but I would expect them to pump in some funds for a by-election and do substantially better, though the Libs would remain the clear favourite. I think there is a real problem with a conflict of interest issue when both a council position and a state seat are occupied by the same person. If you take the opposite view then it is also logical to extend the theory to say that the same person should also have a federal seat! The only state still allowing this is tasmania – surely we should be leading the way in NSW, not being stuck in the past with little old tassie! Geoff Robinson asked a question about Vaucluse in 1988 (above). There was no actual by-election because Michael Yablsey was the only candidate who nominated. He was thus declared the member for Vaucluse as of the date of close of nominations. Hard to imagine something like that ever happening again. This city, this state and this nation needs a real alternative to the Lib/Lab duopoly. I would be happy to see the seat either going green, or to a progressive independent. quite true – The City The State And the Nation needs a real alternative ! I am also running in this election but it seem only the three who jumped the gun are getting any air! Please be aware Glenn Wall of Pyrmont is also running a true Independent. I have lived and worked in this City for 3 decades and am across all issues be they “The White paper” for development part 3a by another name. Public housing maintance or lack of it, Police violence and thuggery, Sale of Ultimo school and lack of places for children in our City schools, open space and sports fields, Youth culture, Night culture and problems. I have worked in Hospitals and Hotels with the wider communities of Sydney on many objections to over development the on going one is Barranagaroo were we forced the state and the developers to de-toxic the site. This has taken more then a year to de-toxic it. Any way Vote 1 VOTE GLENN WALL a true Independent. The Get Clover Bill? The legislative changes effected *28* members of parliament. The only reason we aren’t having 28 by-elections today is that all the others resigned from their local councils. Clover is the one who forced this waste of time and money. She could have completed her term in parliament like the other 27 members. She chose to flatter her ego one moore time instead. SHE chose to nominate for the council elections. Nobody forced her to do that. Two of the prominent candidates here (Chris Harris, Shayne Mallard) were also on the same council. They CHOSE to focus on winning a seat in parliament instead. Clover knew she couldn’t have both, but still went ahead with the local election anyway. She deserves contempt, not sympathy. Don’t be ridiculous. Only two of those 28 had run for another term on council since they won their seat in Parliament. All of the party members (Labor, Liberal, Greens and CDP) were planning on retiring from council. It was clearly aimed at Clover who had done both jobs over an extended period. Also she was given no notice this was going to happen at the last election – so how could she have chosen to stay on council and give up Parliament without a by-election? She had notice that she couldn’t be on council and in parliament when the local elections were held. That was only a few weeks ago! She could have simply NOT nominated herself and continued in parliament. 27 other members held dual positions at the time the change OCCURRED. They all chose to either resign or NOT NOMINATE themselves for council re-election. Clover could have done the same. She didn’t. She, and only she, is responsible for the cost of this by-election. She should have to fork out the money herself. That only makes sense if you assume that everyone wants to be an MP instead of a councillor. When she was elected to Parliament she was allowed to hold both jobs. She wasn’t given an opportunity to choose to just be a councillor/mayor and not be an MP. Your theory only works if there’s no reason why she would have wanted to remain Lord Mayor of Sydney. Clearly she wanted to, and clearly the voters of Sydney did (considering they easily voted her back in). It’s totally reasonable that she would choose to continue. The O’Farrell government completely changed the rules and didn’t give anyone an opportunity to finish their term in Parliament and continue on Council. Compare Clover Moore to the other 27. She wanted to continue on council, they all wanted to continue in Parliament. O’Farrell didn’t force them to resign from council, he gave them until the election to retire in order to give them time to finish their term and not trigger a by-election. He didn’t give that same courtesy to Moore to finish her term in Parliament and then continue as Lord Mayor. His law was grossly undemocratic. Moore hasn’t misled anyone that she would only do one of these two jobs, nor has she promised to retire from one and then backed down on that. At every step in the process she has been honest with the voters and the voters have voted her back in. They elected her Lord Mayor in 2004 and re-elected her in 2008 and 2012, and re-elected her to Sydney in 2007 and 2011. That’s five times she was elected to public office with a majority of the 2CP vote since she announced that she planned to do both jobs simultaneously. Her endorsed candidate has now won an even bigger victory, indicating that the voters of Sydney rejected O’Farrell’s law blocking Clover from being their local MP. Since all local councils are elected at the same time, the other 27 MPs had the same notice as Clover regarding these changes. I’m sure many of them would have preferred to continue in dual roles too. The change brought NSW in line with other states and probably most jurisdictions in the democratic world. For the same person to serve the same population at multiple levels of government creates the potential for conflicts of interest and lack of accountability. If people object to the mayor’s decisions, they can’t voice their concerns to the MP, or vice versa, because it’s the SAME PERSON! There is also a prohibition on state MPs being federal MPs. Was this “oppressing” Clover, too? Maybe she wanted to be federal MP too all these years, but the rules say you can’t, so tough! Most politicians when given the choice between a higher and lower level of government choose the higher. The other 27 MPs did. So did two candidates in this by-election. Clover could have done the same. Nobody “forced” her to do anything. Sadly all these politocs are questionable re their real honest intentions ! Instead of much limited money/resources being wasted on such campaigns , we only end up with more misfits ! & questinable intentions ? & sincere candidate – instead they are all posing to their own pathetic agenda!